Discover our first concentrated Age-Defying Elixir —divine drops of powerful skin goodness for sublime, youthful luminosity. Giordani Gold Age Defying Radiance Elixir is a hydrating, lightly-textured and non-greasy radiance booster created to beautify your skin. It contains specific ingredients designed to defend against signs of ageing and enhance your complexion. After the irresistibly smooth and silky application, your skin is instantly moisturised with a hydrated feeling that lasts throughout the day*. Skin Perfector Complex+, to reawaken your skin’s most beautiful, natural radiance. 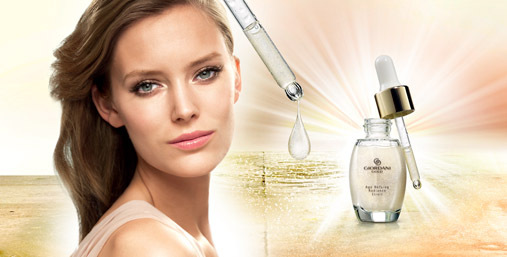 A wonderfully versatile product, and the first of its kind for Oriflame, Giordani Gold Age Defying Radiance Elixir is perfect for giving your skin a naturally radiant glow. Use on its own or under make-up to enhance your complexion.